Easily attach to existing rails. Lot #00-99. Try Nowaste® in your plant for 30 days. 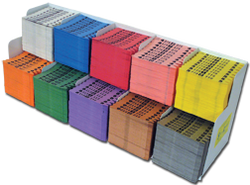 We will send a complete TRIAL PACK consisting of seven different colored tags (8 sizes), one set of rack dividers numbers 2-8 and one 7-color metal dispenser - OVER 15,000 TAGS! The seven-color trial pack will have enough for 3,000 orders! Call today and ask for the "Complete Trial Pack" or "Single-Color Trail Pack Starter Set" - don't forget to specify your colors. The metal dispenser is available in 6 or 12 compartments. Dispenser color may vary. The metal dispenser holds 1 color of 10 different sizes. The metal dispenser holds an entire box of loose shirt tags. 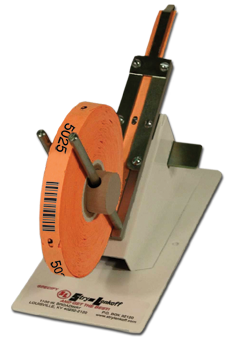 The metal double deck combination strip tag dispenser is perfect for storage. 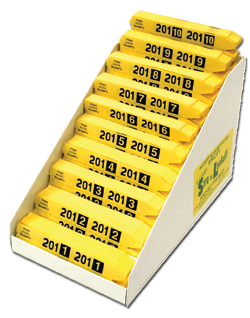 Use the lower deck to hold 10 colors and the upper deck to store one piece tags or other supplies. 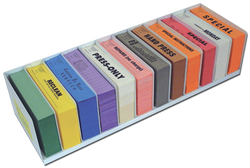 The metal dispenser holds 10 different colors or major #'s of SML-7 or SML-9. The metal dispenser holds 1 of 10 different sizes. The metal dispenser holds 2,000 tags. 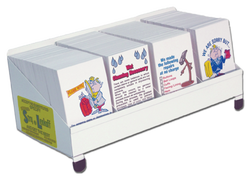 The metal dispenser holds dry cleaning tags, roll flag tags® and roll day tags.